Event data reports provide a log of all events (also called contact activities) in a chronological order. This report includes all message events (sent, bounces, opens, clicks) as well as custom named events (website browse, page views, search). An event will be stored in Cordial for a period of 18 months and can be retrieved during this timeframe. Events older than 18 months are no longer stored within Cordial and cannot be accessed. If you are passing custom events to Cordial, the event data report provides an easy way to view all captured events without having to access the API. To view an event data report navigate to Analytics › Event Data Reports. Note: For event reports, Audience rule filters are run in real time and not at time of message send. Depending on the type of filter selected, the columns will display different data. For events with many properties, you are able to customize the column display by clicking the button "Customize Columns". After selecting which columns to display click the refresh button to display the new column configuration. 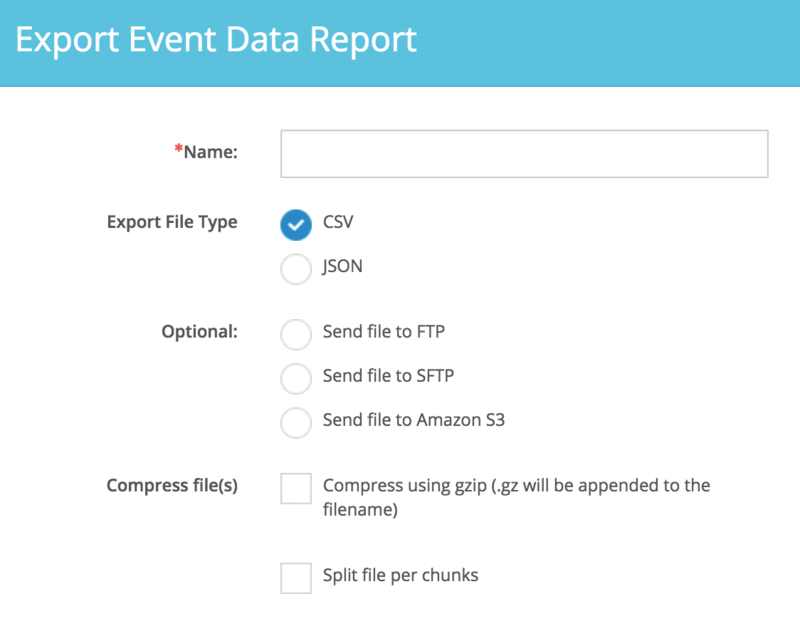 You are able export the report to a CSV or JSON file by clicking the Export button at the top right of the screen. Name: The name of the export file. Export File Type: The type of file to be exported. Optional file destination - If no destination is selected, the file will be available for download on the Jobs page. FTP location - The path to the FTP or SFTP server (ftp.example.com). FTP user - The username for FTP or SFTP authentication. FTP password - The password for FTP or SFTP authentication. FTP Port - The port number for the FTP or SFTP server. Path - The path to the folder on the server (/folder). If uploading to the root folder, use "/". Access key id - The public AWS id. Secret access key - The secret AWS key. AWS bucket - The AWS bucket name. AWS region - The AWS region. Path - The path to the folder (/folder). If uploading to the root folder, use "/". Compress Files - Choose to compress the exported file. If selected, the file is compressed using GZIP with the file extension ".gz" added to the filename(s). Split file into chunks - Choose to split the files into chunks. Count of records per file - When splitting files into chunks, choose the number of records exported with each chunk. Inputting "0" will export all records into one chunk. Note when exporting to Amazon S3: If you choose to compress files and split into chunks, all chunks will be uploaded at the time of export. If files are not compressed and split into chunks, each chunk will be uploaded as soon as they are ready.